The Behemoth will not be rushed. Long before indie video game developers were hot commodities, The Behemoth made a name for itself with the difficult, but charming shooter Alien Hominid. That game made its debut on Newgrounds all the way back in 2002, and it was another six years before they followed it up with the excellent Castle Crashers. Its next game, BattleBlock Theater was announced all the way back in 2009. After a healthy wait, the game is finally going into beta testing. 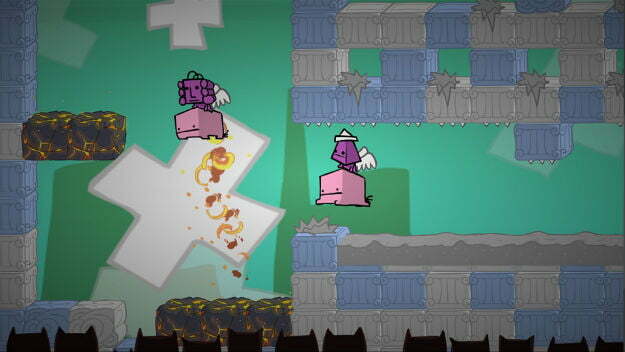 The Behemoth is now accepting applications from Xbox 360 owners to participate in a closed beta of BattleBlock Theater. Only 10,000 applications will be selected to participate in testing that will be carried out throughout February and March. There are a few requirements. Testers have to be Xbox Live Gold members, be at least 13-years-old, and a registered Behemoth Forums user. Anyone thinking that this is an opportunity to play what looks like a hilarious competitive platforming game should also take note of the BattleBlock Theater Beta Test Task List, laying our what’s actually expected of testers. In short it’s homework to go with the game. As of this writing BattleBlock Theater is only announced for Xbox 360. Castle Crashers started as an Xbox 360 exclusive as well before making the jump to PC and PlayStation 3.